Cody is becoming such a big boy! 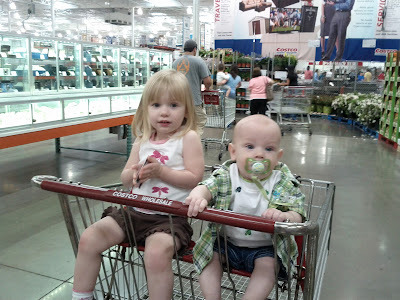 This weekend he rode in the cart for the first time and did a great job! He loved it! He held on to the handle and looked around at everything with a huge smile on his face. Sarah was so cute about it too. She was just as excited to have Cody next to her and she'd randomly pat him on the back and ask him if he was ok or tell him "hi buddy". He'd just beam at her every time she talked to him. Then Friday night he went to the pool at the Y for the first time. Sorry, no pictures I didn't take the big camera and apparently forgot my phone as well. He didn't love it, but he didn't cry. I guess the best that can be said is he tolerated it. He also had squash for the first time this weekend. He loved it. He is such a fan of solids, you can actually hear him say "nom nom" while he's eating. The really big news from this weekend though was today we finally felt one little tooth spike sticking out of the top of his gums. Yes! His first tooth has broken the surface and will be making it's appearance sometime within the next couple of weeks hopefully. And if I'm not crazy I thought I felt another little spike next to it so he may be getting both of his bottom teeth at the same time. He also keeps pulling up onto his knees and rocking so I think by next month he should be at least army crawling. I love that! He's going to be so happy once he's able to control his mobility. Also today he had another first! I'm sure we should have but he had Cheerios for the first time today. Everyone was starving so none of us wanted to be the one to hold Cody while the other person ate so we put Cody in his high chair. He started practically hyperventilating because he wanted to join in the fun. So I put a few cheerios on his tray thinking that would keep him busy trying to get them to his mouth. He loved it! He chased them around, dropped some, grabbed handfuls of them. Because they're lightly sweetened they're also a little sticky so he was able to get some into his mouth. He nommed them until he could swallow. He loved them! He's just growing by leaps and bounds. It's very exciting! He looks so grown up in the cart! And a little surprised to be there.